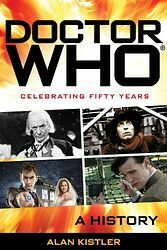 Apart from the major Doctor Who novel ranges (the Target novelisations, the New/Missing Adventures and the BBC novels), there have been a plethora of other official and unofficial Doctor Who tie-in books published over the years: mainly non-fiction such as reference books or biographies. This page lists all such "miscellaneous" books ever published. New: Formerly listed on this page, but now given their own separate sections, are graphic novels, activity books, script books, short story collections and biographies. Note: Most of the books more than a couple of years old are now out of print. For ease of use, the below list includes links to both Amazon.com & Amazon.co.uk allowing you to search for each book, though some of the links may say "File Not Found" if they don't have that particular book on record. However, Amazon does operate a used book service, so specific items can turn up there from time to time. If you're looking for a hard-to-find book, you can also try online auction sites — simply click on the eBay logo beside any book to search for matching auctions on eBay.